The Queensland Hardwood Timber Industry is coming under increasing pressure from many directions. Demand for timber products is increasing at a rapid rate and Queensland has the potential to become a significant supplier and processor of world-class, sustainable and durable wood. Source: letter written by Sean Ryan, CEO Private Forestry Service Queensland. The major limiting factor for the Queensland Timber Industry will be future resource supply, and to date this has not been adequately addressed by either Industry or Government. On one hand, we have world class timber species, a robust code of practice, existing infrastructure, processors and markets. One the other hand we have a shortage of skilled workers, diminishing resource availability and an unstable policy environment that undermines long-term investment potential. Without drastic intervention, the future of the 40 hardwood mills of southern Queensland and the thousands of people the extended industry employs, will be in halved. 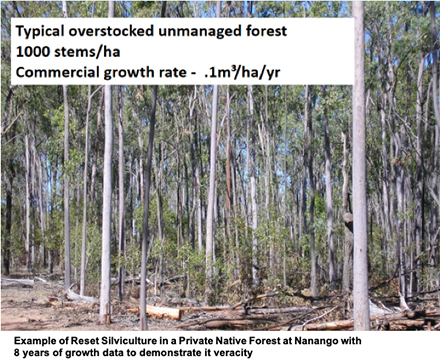 SE Queensland has a significant private native forest resource (2.4+ million ha) that is generally in an unproductive condition. The State-based native forest resource has been heavily cut and will have limited available wood after 2024. The Southern Queensland Hardwood Plantation Program has failed to provide an adequate volume and quality of wood for direct replacement of the state forest resource. The majority of the timber processing industry is still using poor harvesting regimes that lead to further degradation of the private resource. The private resource will be further reduced by the proposed Code review to (1) raise the retained stocking levels from 150 to 250 stems/ha in direct contradiction of the science, which clearly demonstrates 130 stems/ha as the optimal numbers and (2) restricting harvesting in endangered Regional Ecosystems, which are some of our most productive forests and cover at least 200 000 ha. Increasing demand for durable timber has resulted in a severe lack of trained and skilled harvest operators. Contractors directly impact the quality of the retained stand through their tree selection methods, and invariably all the future productive trees are removed leaving the rubbish to grow on to a very substandard product. PFSQ has also established 25 demonstration sites across southern Queensland, supporting 220 permanent growth plots within Code compliant, managed native forests. The growth plots demonstrate the overwhelming environmental benefits of good management techniques in comparison to the alternative, ‘no-management’ scenarios shown in the control plots. A typical, unmanaged regrowth forest contains a single age-class of small diameter, unhealthy trees, with slow growth rates and limited groundcover and mid-storey development due to the restricted sunlight reaching the forest floor. A well-managed production forest will have a range of age-classes growing, providing diversity of structural layers throughout the canopy, it will also have a well-developed ground and shrub cover layer, due to increased sunlight reaching the forest floor. A well-managed forest will provide habitat attributes for a broader range of fauna species than an un-managed forest. 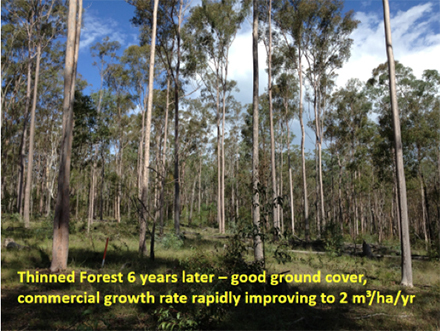 Improved ground cover; with significant increases from <10% in unmanaged forests to >60% in thinned forests. Improved ground cover is directly related to a reduction in soil erosion, especially in the highly erodible sodic soils associated with the upper catchments of much of the reef lagoon. Improved ground cover is essential for the vulnerable listed Rufus Bettong and Potoroo which both require substantial grass cover to feed and hide in. Over-stocked forests generally have little to no ground cover. Over-stocked regrowth forest provides very poor structural diversity; an important habitat factor for many species including gliders. All gliders require significant space between trees to glide. We find a high number of yellow bellied glider feed trees in wide-spaced, managed forests. Over-stocked forests have very slow diameter growth rates (0.1 – 0.2 cm/yr) compared to managed forests (0.8 – 1.4 cm/yr). The potential to grow significant habitat trees is much greater in managed forests. Thinning has an immediate increase in soil Carbon levels. Consistent with these results the Department of Agricultural and Fisheries has funded a pilot private native forestry extension program, now in its final stage, to provide information, extension support and limited financial assistance to encourage landholders and the timber industry to increase investment in private native forestry opportunities. PFSQ has delivered 26 months of this 31 month program on behalf of DAF. 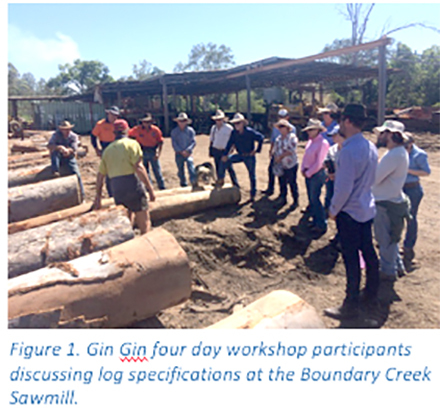 The program aims to raise landholder and forest contractor capacity and understanding of best practice native forest management via field days, workshops, industry forums and other extension events. The program has generated a high degree of interest and participation with significantly higher attendance at field days and workshops than at any time in the past. Indeed the financial assistance program to encourage landholders to thin and manage their forests is already substantially oversubscribed demonstrating a highly effective methodology to generate on ground change. The project has run 24 field days, 10 extension events, 7 x 4 day workshops attended by more than 1042 people and generated a significant momentum in forest grower’s interest and participation in managing their forests. A minimum 1400 ha will be thinned under the small pilot financial assistance scheme ($90 000) offered by the project. The private native forestry extension program has demonstrated the success of this intervention methodology to generate on-ground management change, improving the productivity of these forests tenfold. 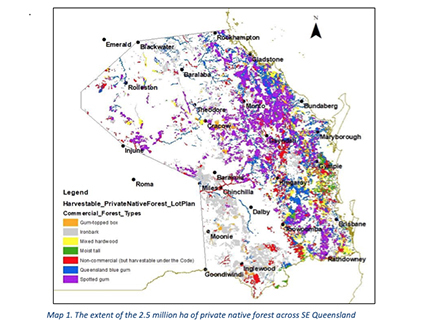 With the diminished availability of the state forest hardwood resource (post 2024) and the potential loss of large portions of the private native resource, our hardwood industry could lose up to 50% of the 40 sawmills in SEQ by 2028. To avert this, a Six million dollar program of financial assistance to forest growers could be implemented, based on a $1 in $4 public – private partnership and thinning 68 000 ha. The public contribution to the assistance program, will achieve the recognised social benefit of improved forest health, habitat values, Carbon sequestration and soil condition (improved ground cover substantially reduces soil erosion into the reef lagoon). This program could be up and running on the tail of the extension project and by the start of next financial year with the support of your government. It is of paramount importance to the future of the 40 hardwood mills of southern Queensland and the thousands of people the extended industry employs that we increase the area of managed private native forests to 500 000 ha. Over time this improved productivity would provide an additional 500 000m³ of hardwood per annum into the timber industry. 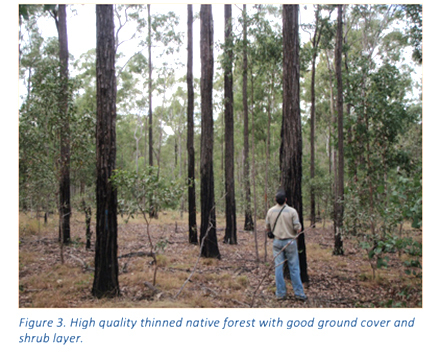 2014 – Review of the Code – Managing a native forest practice; A self-assessable vegetation clearing code. This review made a number of changes to the Code, one of the changes was the introduction of a list of regional ecosystems (REs) in which harvesting and thinning could be undertaken. The clear intent of the code was to limit a native forest practice to the regional ecosystems that only supported recognised commercial species, however in the compilation of the list up to sixty legitimate REs were omitted e.g. 11.11.15 – Eucalyptus crebra woodland on deformed and metamorphosed sediments and interbedded volcanics – Current remnant forest area – 521,000 ha (pre-European extent – 890,000 ha). E.crebra is the second highest harvested species by volume after spotted gum in Queensland and it is discriminatory to those landholders prevented from managing and eventually harvesting within those REs. 2016 – The introduction of Flora Survey Trigger Maps in a bid to comply with the Nature Conservation Act resulted in a 2 km radius of an apparent (real of otherwise) sightings of protected plant species meant the requirement for floristic survey be undertaken if the landholder wished to thin country in that area, harvesting is exempt as long as no new clearing occurs within the blue dot area. There was no extension/education, explanation program associated with this change, and landholders started hearing about after stop work orders were implemented in a number of areas. 2019 – Currently of greater concern, there have been inferences in the latest Code review that there will be further restrictions considered or diminution of harvesting rights within Regional Ecosystems that have an endangered listing. The Southeast Queensland bioregion stretches from the town of Gladstone in the north (23°51’S, 151°13’E) to Springbrook national park in the south (28°21’S, 153° 6′ E) bordering New South Wales. The total area of the bioregion is 6.7 million hectares. (Ngugi1*, Neldner1, Ryan2, Lewis3, Li1, Norman4 and Mogilski1 2017). Within this area there is more than two million ha’s of mapped Remnant or high value regrowth supporting commercial species and harvestable under the current Code. Of this there is a minimum of 110 000 ha mapped as Endangered; (eg Moist open forests to tall open forests dominated by Eucalyptus pilularis, 35 848 ha; Woodlands dominated by Eucalyptus tereticornis or E. coolabah 104 222). The majority of these forests are highly productive and capable of producing in excess of 4m³/ha/yr; the Blue Gum flats in particular have had significant management (monetary) inputs in the past due to their high grazing value. Any restrictions on harvesting these forests will result in an immediate loss to land holders of (40m³/ha x $100/m³ x 110 000ha) $440 million and an accrued future loss $22 million/yr for the timber alone. There is little wonder in why Landholders don’t trust their future rights to harvest or manage their forests. The simple solution to this is to establish a managed Vegetation Category (Category F) similar to Tasmania’s Private Timber Reserves (1989) within Queensland’s Planning Act. A private timber reserve is designated under a state statute for forestry purposes performed under an approved management plan and registered on the title.